___The Palm Pilot Robot Kit is a design for an easy-to-build, fully autonomous robot controlled by a Palm handheld computer. This design was created by two Carnegie Mellon Robotics Insitute research groups, the Toy Robots Initiative and the Manipulation Lab , with the intent of enabling just about anyone to start building and programming mobile robots at a modest cost. ___The Palm makes a handy robot controller: it packs a lot of computational power in a small size, runs on batteries, and best of all, can display graphics and an interactive user interface. Our robot empowers a Palm to move about and sense the nearby environment. The base uses three "omni-wheels" that allow driving in any direction with independent control of rotation, meaning it moves holonomically in the plane. The base also has three optical range sensors to "see" the nearby environment up to about a meter away. ___The complete construction plans and software are documented on these pages. The entire robot can be constructed from standard parts using glue, tape, and a small amount of soldering. The software we provide can be compiled on a Windows PC using the free Code Warrior Lite compiler and downloaded to the Palm. The robot can then drive itself around on flat surfaces, using optical range sensors to sense nearby obstacles and walls. 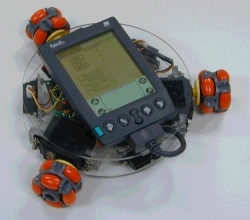 ___The picture shows a Palm Pilot Robot built by The Robotics Institute. Acroname, Inc. provides two slightly different versions of PPRK, that had been modified for easier assembly. Acroname, Inc. also provides kit materials and parts. A Beginners Guide and necessary libraries are added to Software page. that you can build using a single Phillips screwdriver in about an hour. Add a digital compass to the PPRK! What it's like to build a Palm Pilot Robot Kit ? ___The Palm Pilot Robot Kit project grew out of an earlier project in the Manipulation Lab to develop easy and cheap rapid prototyping using simple construction techniques and hobby servos. This was described in a technical report, "Rapid Prototyping of Small Robots" (G. Reshko, M. Mason). The Robotics Institute at Carnegie Mellon University was established in 1979 to conduct basic and applied research in robotics technologies. It is part of the School of Computer Science. the Heinz Endowments and the National Science Foundation (Grant IIS-9900322). Questions? Comments? Contact us at pprk@cs.cmu.edu.